Thanks for answering our questions today, Cameron! You began your writing career in educational publishing. Can you tell us a little bit about the path you’ve taken through that side of the industry? I’m not a teacher, or a librarian, but I’ve worked in educational publishing since 2001, editing books for primary school classrooms, and teaching materials to go with them. 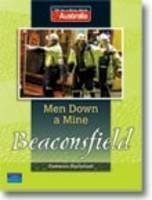 But I was always more excited about the idea of writing, and finally got the chance in 2008, through a commission to write an upper-primary library book about the Beaconsfield mine disaster. Fortunately that led to further writing commissions – fiction and non-fiction – for a range of publishers. The whole time though, I’d been plotting to move into mainstream trade publishing. The Max Booth series has been the bridge that’s helped me cross that gap, and to bring those two worlds together. 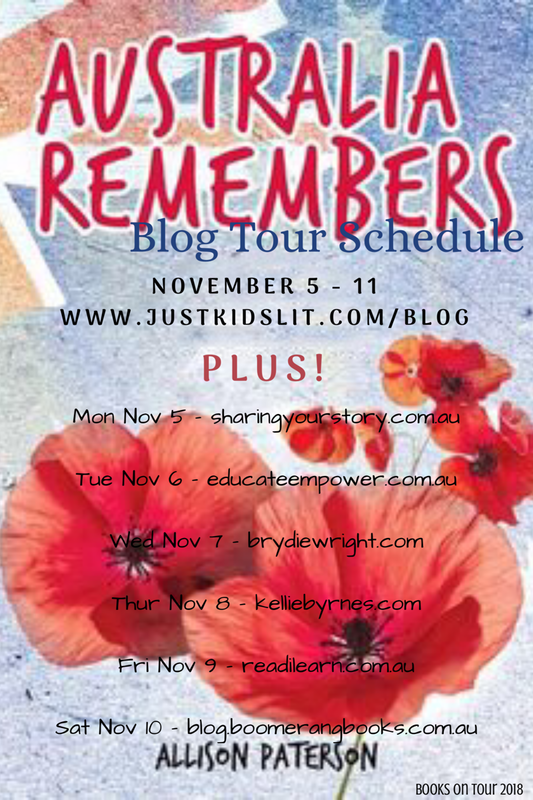 Do you think your educational work has had any particular influence on your non-educational writing? I’m sure it has an effect, even when I don’t want it to! With kids’ fiction, unless it’s a commission with a specific educational purpose, I usually don’t consciously think ‘let’s make this educational for the kids’ when I sit down to write. What I want most is for kids to get excited about reading, so if I’m thinking anything during writing, it’s to keep it as action-packed and funny as I can. That said, my experience in educational writing has definitely made me more aware of the need to write texts that can appeal to reluctant and struggling readers, as well as the general readership within a certain age bracket. You’ve written over 80 books for children in the educational market as well as your own fiction titles. What style of writing do you find most enjoyable? You’ve set the Max Booth series in a futuristic setting, with flying vehicles and floating suburbs. Does this interest in technology come from any kind of background in technology? I’m hopelessly un-technical myself. I consider it a major technical achievement to produce a Word document every now and then. But I’ve had a fascination with robots and futuristic design since I was a very young kid. I’m pretty sure it started with Star Wars – R2-D2 in particular. 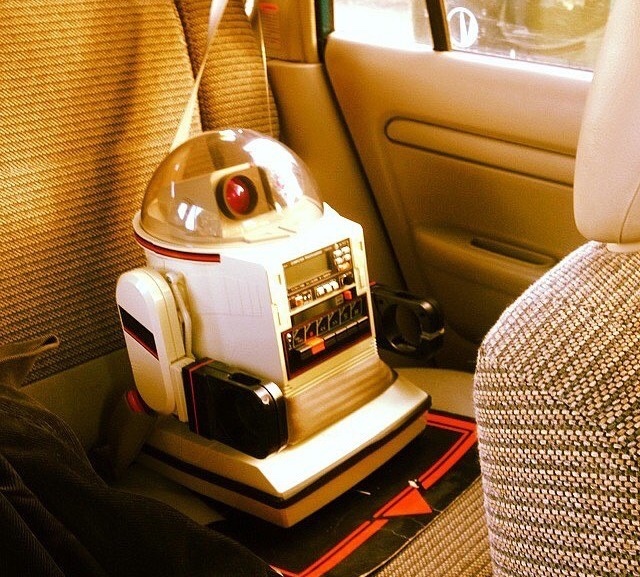 Did you have any robots of your own as a child? Well, yes, but not quite the one I wanted. 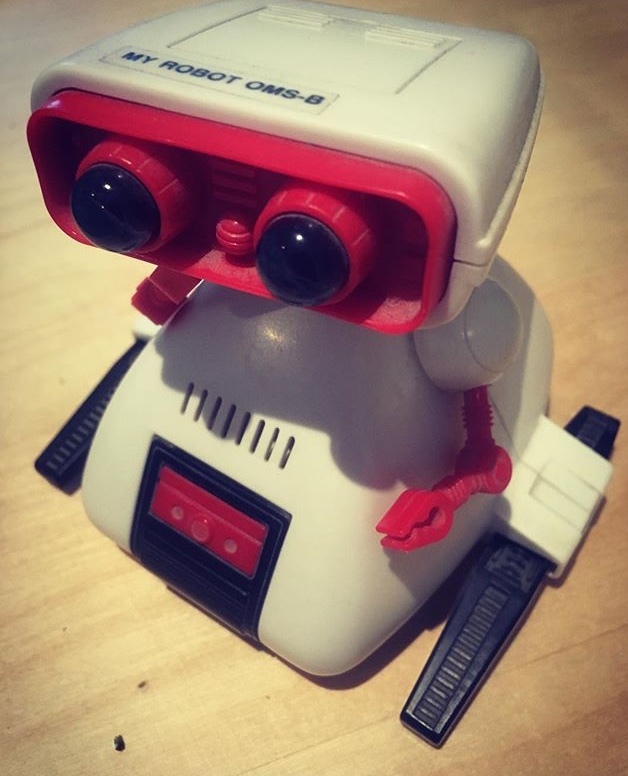 I was desperate for an Omnibot – a programmable remote-controlled robot that could play cassette tapes and could even talk (with your own voice, when you spoke into the remote control!) But they were way beyond anything I could afford with my $1.20 a week pocket money. The happy ending is, I finally got one a few years ago thanks to the good people of eBay. It’s only semi-functional but it definitely looks cute on my bookshelf. I do still have the substantially cheaper robot my parents were nice enough to buy me as a consolation. I’m not sure what it was called, but it’s got a one-button remote control. It only goes in a straight line when you push the button. Otherwise, it just goes in reverse circles. The idea is, you wait until it’s facing the direction you want it to go, and then you press the button. I thought that was a bit weird as a kid, but now I think it’s quite clever in its simplicity! Stamp Safari, the third title in the Max Booth series, whilst focused primarily on adventure, mystery and friendship, also includes underlying themes of belonging, social class and the importance of education. Was this your intention? What other themes have you weaved in to the story? It definitely was intentional to weave these themes in. Although my biggest goal is to entertain the reader, I do like to brush on some deeper issues in the stories, even if only briefly, to add some more depth and emotional resonance where possible. Some other themes I’ve tried to touch upon include environmental sustainability, and the idea of loyalty versus perceived obligation. What has been your favourite part of creating the series? Did your plans to write a series work out the way you initially envisioned? My favourite part is definitely the plotting of each story. I always agonise about which item to have Max investigate, but as soon as I’ve made that decision, the fun begins. It usually starts with one focal question: What secret does this object hold that could lead Max and Oscar into trouble and adventure? It’s been incredible seeing the series come to life. From the beginning, I had a very strong sense of how the books should look on the page, including the artwork style, and even the covers. I’ve ended up with three books so far that match the way I imagined them so closely it’s almost uncanny. We all want to know… what does the future look like for Max Booth and his mates? Where will they end up next? The future remains very busy for Max and Co. There’s no shortage of strange items to investigate, from primitive decades like the 2010s! The next one they examine is a canister containing a long reel of translucent plastic that prehistoric people once used for taking photos, back in the 20th century! A long-lost picture on the film is going to lead Max and Oscar into some very un-picturesque situations. How do you think teachers could use the series for English teaching? I think that Max, or any similar sci-fi series, can work as a great creative prompt for teachers trying to engage students who aren’t particularly practical or literal thinkers. Particularly in creative writing, sci-fi scenarios can free kids up to write stories that don’t necessarily adhere to logic or linearity. When you’re writing the rules of the world you create, no one can tell you’re wrong, which can be extremely empowering. What do the activities offer teachers in terms of Technology teaching? Through the activities, I try to encourage students to extrapolate some of the technological threads in the stories, for example, to design their own versions of objects encountered in the stories, or to imagine future versions of items they use regularly in their own lives. Basically, I’m trying to get students thinking about all sorts of important issues through future eyes, and to question whether all technological advancement is necessarily positive for our planet and everyone on it – looking at the present with hindsight, if you will. Sci-fi can provide a really good framework to make this kind of thinking easier. Do you have any advice for other writers launching into the sci-fi realm? I’m the worst person to ask in a way. I should probably say ‘Read lots of sci-fi!’ but hardly reading any of it myself, I’d be a liar! That said, I do think the strongest responses to Max and Oscar have come from readers connecting with them on an emotional, level, and from finding the humour in the stories. So, I think I’d say: whatever else you do, develop a scenario for your story that allows the humanity of your characters to shine through – even if they happen to be robots! 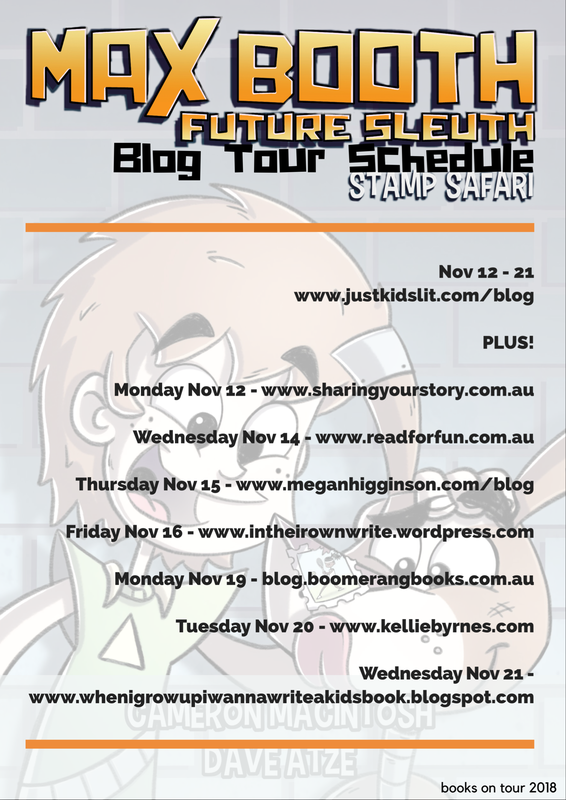 Focus now on this rad review of Stamp Safari by Melissa Gijsbers at Read For Fun!